In the hope that spring will someday return, I have made myself a pair of rather lovely trousers! I used this gorgeous cotton fabric and the Tilly and the Buttons Marigold to make these. It was my first time using the Marigold pattern, but they were really easy to make. They were a lovely breather project while working on my anorak. 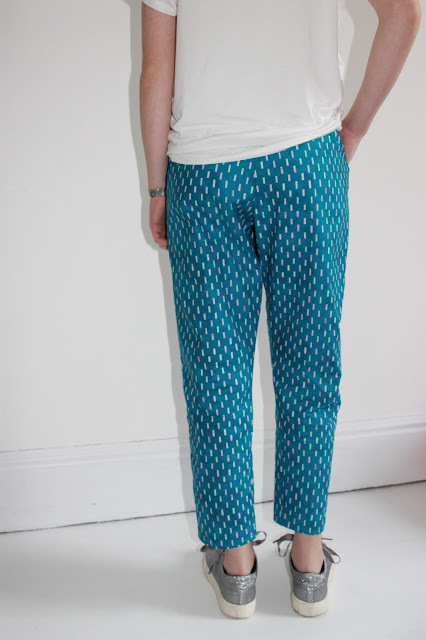 I made these trousers and the pineapple trousers for my sister in the same week, and I really enjoyed making both pairs. The fabric was slightly brighter than I was expecting, but I think that the colour is just perfect for spring. 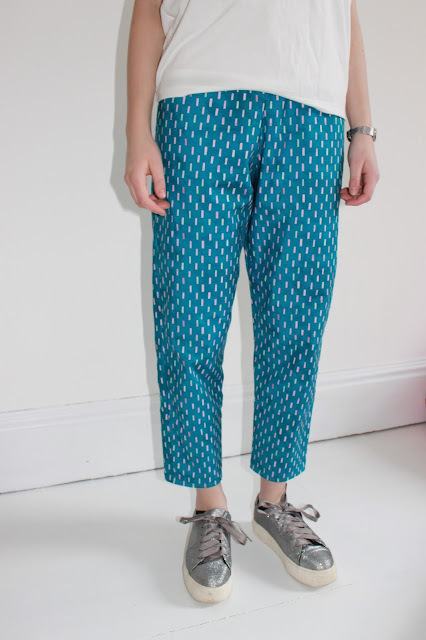 I really love the pattern on the fabric, and I knew straight away that I wanted to make a pair of spring trousers (despite the fact that it is freezing outside!). This was my first time using the Marigold trousers, and I'm so glad that I bought the pattern despite my original reservations. The pattern comes with a jumpsuit version too, and as this isn't something that I am likely to make I missed the trousers when I glanced over the pattern initially. The fabric was a dream to sew with - I love the stability of cotton - especially after sewing with thick fabric, something that I have been doing a lot of recently. I finished all the seams inside with a zigzag stitch. Despite taking my time to make these they were still a really quick make. My favourite part of these trousers are the lovely deep pockets. The elastic waist also allows them to be really comfortable, yet the darts and pleats allow them to look sophisticated and not too much like pyjamas! 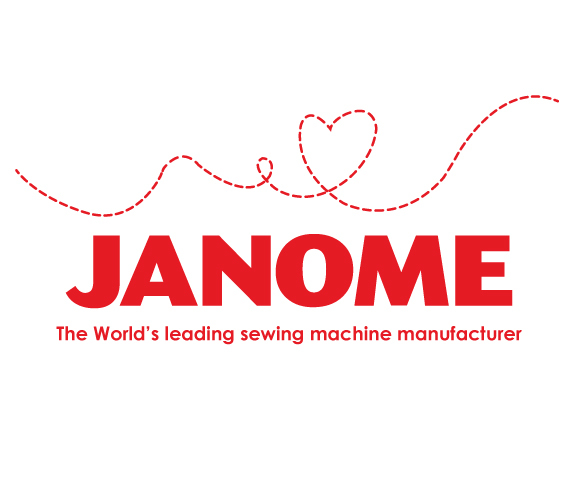 I'm a big fan of small, secret details and so I sewed the hem with a double row of stitches - not something that anyone else will notice but I like it! I shortened the length of the trousers slightly to make them more cropped, another thing I really love. 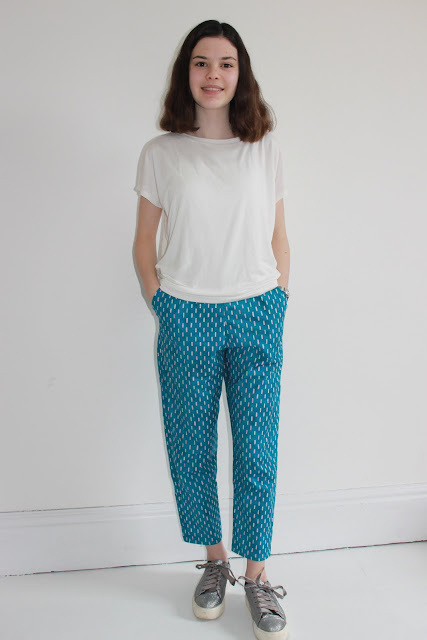 I am so happy with my new trousers! At first, I was worried that they would be a bit too bright, but with a simple white top I think that they are perfect for the sunshine that i'm longing for during this bleak February weather. I would really recommend this pattern for beginners, especially if you use a lovely stable fabric like this cotton. Lovely trousers! The fabric sings spring, and looks nice. These look so cute on you!! I love this fabric--it is just perfect!